Well, if you don’t need an assault rifle to take down a nut with an assault rifle, WHY THEN DO WE NEED ASSAULT RIFLES??? It’s not rocket science. Such weapons are good for only two things… obliterating targets at a shooting range, and obliterating people… as many as quickly as possible. It’s time to reinstate the “Assault Weapons Ban” from the ’90’s. And that includes the ban on extended magazines/clips. If you can’t hit your target in 10 shots, you probably have no business firing a gun in the first place. I’d also suggest imposing a stiff tax on cordite/gunpowder. Taxing bullets is no use when people can pack their own ammunition in their garage (many sports-shooters do so to save money). And home made pipe-bombs aren’t sold at your local gun store. I assure you, Mr. Maniac isn’t mixing gunpowder in his basement. Both bullets & bombs require purchasing gunpowder, and a heavy tax means fewer sold/made. Now, the “No limits on the Second Amendment” crowd who decry limits on clip-size argue that “no one has the right to deny someone their right to fire 50 bullets without stopping to reload just because they’re a lousy shot!” (Note: There is NOTHING in the Second Amendment that says the “convenience” of a gun owner must be taken into consideration.) 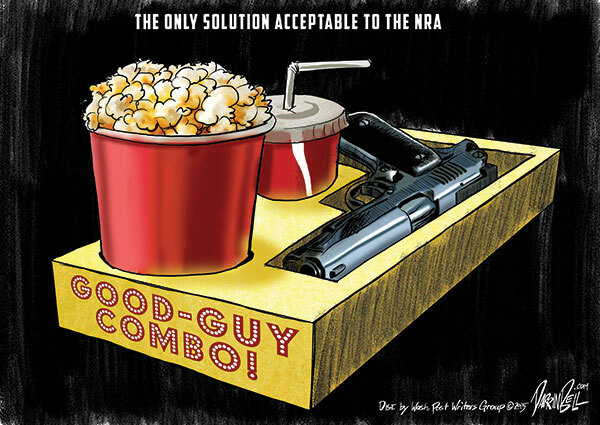 And while most Americans are not THAT unyielding to common-sense gun restrictions, those voices are the loudest thanks to the “Industrial sized” NRA-bullhorn they carry with them everywhere. It’s also why nothing ever gets done in Congress every time we have another mass murder. The gun lobby & their Congressional puppets sold their souls when they decided the mass murder of twenty 7-yearold children & 6 faculty members was an acceptable price to pay for doing ABSOLUTELY NOTHING following the massacre at Sandy Hook Elementary in Newtown, CT. They again did nothing following the mass shootings in Charleston & Chattanooga. Snarky Right wingers joke about Democrats wanting to pass “more useless gun laws every time there’s a mass shooting”. “What good would it do?”, they ask. “Criminals don’t follow gun laws!” Their fallacy is that… while we demand new gun laws… typically targeting gun manufacturers not “criminals”… THEY NEVER GET PASSED! Dems call for them. Republicans block them. Nothing happens and no new common-sense restrictions are instituted. Worse! Existing gun laws are weakened, repealed or allowed to expire (eg: the 1994 Assault Weapons Ban). So when it happens again, the gun nuts decry, “Every time there’s a mass shooting, you demand more useless gun laws!” Yes! And one of these days, we’d actually like to see one of them PASSED! At the Far Right end of the spectrum, there are the Libertarians who believe there should be no limits on Constitutional rights. If you want a shoulder-fired surface-to-air missile to shoot down those U.N. Black Helicopters coming to put you in a FEMA Camp, you should have that right. A paranoids paradise where the sane get caught up in an arms race with the INsane because no one is willing deny the delusional their right to any weapon they desire. By Sunday afternoon, the news was reporting that the Orlando gunman called the police just prior to his rampage to tell them he had “pledged allegiance to the leader of ISIS.” But this was no ISIS-trained radical that traveled 10,000 miles and snuck into the U.S. with an AR15 or AK47 assault rifle in his knapsack. No, this yutz was a security guard for a gated community in South Florida who had a gun permit and purchased his weapons legally in a state with some of the most lax gun laws in the country. The ONLY link between the Orlando shooter & The War on Terror is that our 15 year long war is radicalizing domestic nuts with easy access to guns. We need to bring back the ban on Assault Weapons. Opponents say, “If you ban assault weapons, only the bad guys will have assault weapons!” Fine, but you’ve already BRAGGED to anyone willing to listen that you don’t NEED “an assault rifle” to stop a maniac with “an assault rifle”. Over time, as fewer assault rifles are produced, their numbers will eventually dwindle (as they stop functioning, become valuable collectors items, or are destroyed.) And with no new ones being made or sold, as they become more & more rare, so will the mass carnage they create. That will take time, which is why the more immediate step of taxing the explosive material (cordite/gunpowder) that makes such mass shootings possible will have more of an immediate impact until the weapons ban bears fruit 5/10/20 years down the line.